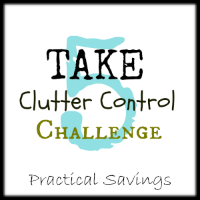 So far we have completed Day 1 and Day 2 of the Take 5 Clutter Control Challenge. If you are participating, don’t forget to link up or comment on the updates each day. I’d love to see or hear about what you were able to accomplish. Today is Day 3. Are you ready? If you’re participating in the Take 5, please comment below and feel free to link up any posts you make regarding the challenge when I post my update later today. I would love to see pictures and hear results. *We have no furniture in our dinning area other than table and chairs so if you’re like us, it might be hard to find 5 items. I plan to just see if there is anything I can get rid of (have a couple shelves) and just clean the area.